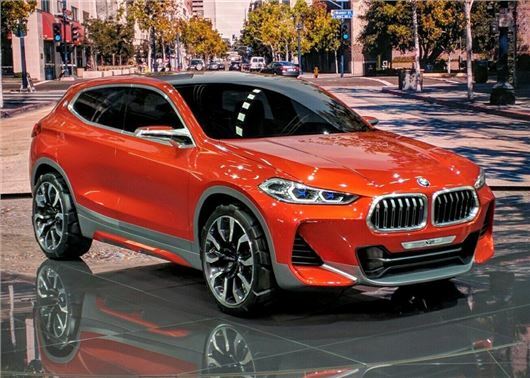 BMW has given its clearest indication yet that it is planning to add a Range Rover Evoque rival to its range, with the launch of the X2 concept. The compact five-door crossover was unveiled at the Paris Motor Show and could make it into production for 2018. The BMW X2 is still very much in the concept stage, but it is understood to be penned for full production within two years. The platform is effectively based on the X1, which means it will get the option of two-wheel or four-wheel drive. The engine line-up will mirror the X1, with four-cylinder 2.0-litre petrol and diesels offered with a standard six-speed manual or six-speed automatic. Claimed fuel economy will range between 45-69mpg, depending which version you choose, while power outputs will span from 150PS - 230PS. The design reflects the beefy nature of BMW's X range, with large overhands and muscle wheel arches. The front is dominated by a large kidney grille, flanked by sweptback LED headlights. The narrow roofline looks sleek too, although it suggests that the X2 will offer less head room than the car on which it is based. The BMW X2 will go up against the Range Rover Evoque when it reaches the UK in 2018, with a luxurious leather interior and broad list of customisation options. Audi is planning a similar sized compact SUV, in the form of the much anticipated Q4.